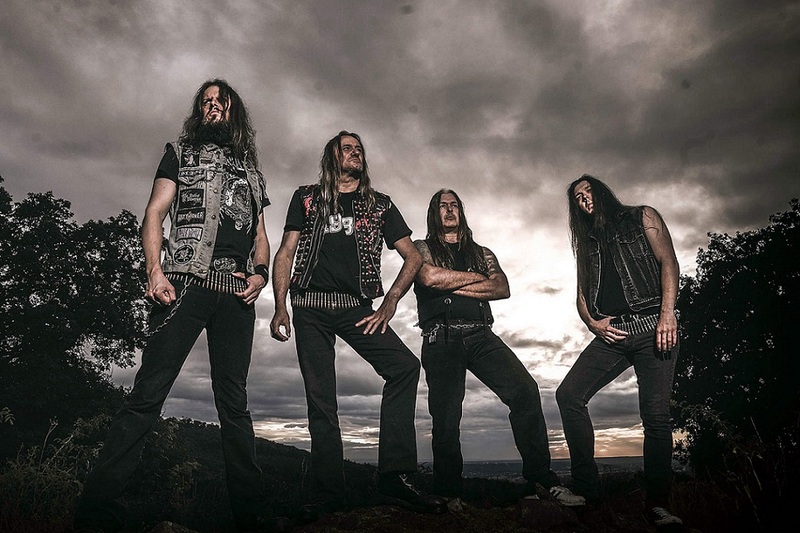 Share the post "SODOM (Tom Angelripper) INTERVIEW"
Sodom are one of the first bands that I was really hooked on back in the mid 80s and to which, to this day, I pledge both my total support and allegiance. This is not a simple case of fan addiction, as Tom Angelripper’s Thrash Metal trio has been quite consistent in releasing good quality albums, the latest being “In War And Pieces”. On the early evening of the 6th of February, prior to the band storming the stage of the Camden Underworld for what was to be a truly explosive show, I met up with Tom in the band’s tour bus for this interview. As expected, we talked about all things “In War And Pieces”, the recent changes in the band’s line up, the passing away of yet another ex-Sodom member and we finished things off by talking about Tom’s current activities with his other project Onkel Tom. • Tom, thank you very much for taking the time to do this interview. It’s a pleasure to have you again here in the UK as I believe that there was a period of ten or eleven years that the band had not performed on British soil. Luckily for us, your recent performance at Bloodstock brought you back to the attention of UK fans and now you have returned with an amazing new album. We will get the chance to talk about “In War And Pieces”, however, first we need to focus the new line-up change and the ‘departure’ of an ex-member. • Ok, first of all, what happened with Bobby (Schottkowski, ex-drummer)? Please don’t feel you have to go into too many details if you don’t feel like it, but those of us who bought the “Lords Of Depravity” DVDs and saw all those interviews featured there were under the impression that Sodom were a solid trio…what happened there? Tom: Ahh…I cannot tell you (laughs). I think…there were some private problems between me and Bobby and he could not separate privacy from performing music with Sodom. He said to me “it’s better that I leave the band”…yeah, that’s it! During the end of last year we had three shows that we had to cancel because of this situation…it is really sad, you know, to have to cancel shows! He told me “I cannot work with you anymore; you are not my friend anymore, so I have to go”! There were simply private things, you know? It had nothing to do with music, I was happy with him as he was a really good drummer. • Well, if the reasons are private then they have to stay private, so this is where this subject will end! You, however, managed to come up with a replacement really fast (note: Markus “Makka” Freiwald) and from what many people say about him, even though his history and past are not well known, he is a good musician. How did this collaboration occur? Did you know where to look beforehand or was Markus introduced to you by friends of the band? Tom: He came into this band very fast, you are right, but we did not have enough time to check other drummers out, you know? I have known “Makka” since the mid-80s as he was a member of Despair. He also played for Voodoocult, in Rotting Christ and many other different projects. I knew that he played in other bands as well and even with Kreator (laughs). Tom: Yes, but only for a tour I think! Bernemann (guitars) gave him a call and talked to him of the fact that Bobby left the band and that we were looking for a replacement for the next few shows and for the upcoming tour to which he responded “yes, I have enough free time so I will do it”. He learned very fast – he had to learn about thirty songs in a very short period of time and…it’s amazing – he is a very good drummer! He is a very nice guy, so I hope that the fans will accept him – that is my problem at the moment. Some say “he doesn’t have long hair” or “he doesn’t look like a metal head”, you know? • Is such a thing still important in the year 2011, having long hair? Tom: I think that for some people it is important, yes. He does have short hair, something that I really don’t mind because he is a good drummer, you know? That is the main point here! I hope that the fans will accept him and that we get to work with him in the band. • So is Markus kind of going through a ‘probation period’ at the moment or is he purely and simply the new Sodom drummer? Tom: We don’t have any contracts signed or things like that – we will see what happens, you know? I am not going to tell you that he is our new drummer for the next ten years or anything like that at the moment. Right now we have a couple of shows to do, a tour and also a couple of festivals that we are going to play in Germany in the summer so we will see what happens. I, however, always want to keep band members – I have never kicked someone out of the band, you know? Bobby left the band – I never kicked him out! • That is a very interesting thing because everybody who knows you says the best things about you, how straight forward and down to earth you are and yet Sodom have been through so many different line-up changes over the years! It’s like having a small black cloud constantly over you! Tom: This is very easy to explain. I never kicked anybody out of the band…well, Witchhunter (aka Christian Dudek: drums) and Andy Brings (guitar) were the only two that I kicked out of the band and that was because they did not do their job! Chris Witchhunter was an alcoholic who massively abused his health and cancelled shows so I had to kick him out. I want Sodom to be a project that I look forward to working with, you know? I don’t want to take steps back, only forward. My musicians, my drummer and my guitarist, they have to support me and the whole band/project that’s called Sodom! • Fair enough! With regards the passing away of “Strahli” (note: Dirk Strahlmeier: guitars), how did that happen? Tom: Strahli played guitar for us back in 1995 and played in one Sodom album which was “Masquerade In Blood”. It was drugs – a classic case! I remember back in 1995 he was still abusing his health with drugs like heroine… Polytoxicomania… he took everything. This past November and December we had a pretty hard winter and he was homeless at the time. He took drugs and he spent the last days of his life in a hospital. What I have is unofficial information – nothing solid. I did not speak with either his father or his mother, I don’t know where it is that they live…yeah, and that is a classic case! • Are you guys planning on doing something like a memorial gig for him or anything like that? Do you have any plans for something special to commemorate his life and contribution in Sodom? Tom: No, not really. What I wanted to do was…next year we will celebrate the 30th anniversary of Sodom and we plan to have all the ex-members on stage with us. I wanted to get Strahli with us but now we can’t and that is very sad indeed. He was also a very good guitarist but the drugs were more important to him, you know? That was the lifestyle he chose to lead. • Ok, I believe that we covered many bad issues already so let’s talk about something more positive. 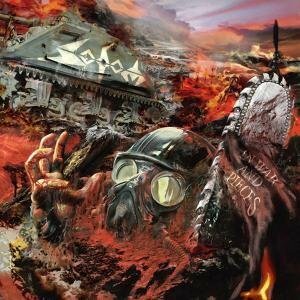 Sodom are back with an amazing new album that’s entitled “In War And Pieces”. I don’t know how you do it each and every time – it’s feels like having a bet with yourselves! I am a massive fan of Sodom, I am not going to hide the fact, so I am always quite curious as to how the next album will be in comparison to the previous – a sense of insecurity and excitement that is rewarded each time with another good effort on your part. Tom: Well, we didn’t change anything with regards the way we create our music. If you compare this new album with our other later day releases there is not such a big difference there. I believe that the only difference is with regards the sound. • Allow me to disagree with you here Tom! I find that with regards the guitar playing, you are slightly more adventurous this time round in the way that the main melodies operate and are performed. It seems to me that you took one extra step as we have more twin guitar melodies, more classic Heavy Metal orientated melodies in this album than we had in the previous few releases. • So how did you guys achieve such a strong organic sound? Tom: I spoke to Waldemar (note: Sorychta: well-known drummer and producer of many bands) when I met him at the last Rock Hard festival and I told him what I would want to achieve in terms of sound if I were to produce a band. A drum kit is a big instrument so it has to sound as one! I don’t want my drums to sound like they did in the 80s but if you listen to “Agent Orange” or albums of other bands at the time you will notice that the drum sound was big! I also wanted the guitars to be closer to the ear, you know? Bernemann has a style that mixes really heavy parts with very melodic parts and that is a good combination to have. The most important thing about this is that we don’t get to spend all our money in a high tech studio. I spent all our money on the producer and he said “Ok, the money you gave me is enough to guarantee a good sounding album and we can produce as long as we need to”. Everybody needs to be satisfied in the end. Most bands tend to get two weeks in the studio as they only have enough money to cover that period of time. That is a big difference and that is why I believe that “In War And Pieces” is a wonderful album. I like all of our albums so I don’t like to compare them. • Tom, much as I like “Obsessed By Cruelty” I believe that this is too much of a bold statement to make! Tom: Ok, this album had a big influence on the scene and stuff but what we want to do is to write better songs without changing anything. • There is only one consideration that I have with regards the new material, one which you will pretty much answer for me tonight when you hit the stage. When you create songs that have too many layers of guitars in them and you have to play live with one guitar player, something will have to be sacrificed. Now, I always felt, also with regards other bands like Destruction, that having two guitar players on stage will bring out a much better result and based on that, I am quite interested to see how the new songs are going to come across live tonight. Tom: It will be very hard as there are a lot of songs that we cannot play because of that reason. I mean, you can play them live but you will miss some important guitar parts, some pickings and second rhythm guitar stuff…yeah, that is a problem, but that is a problem that we always had as a band. Songs like “Nuclear Winter” or “I Am The War”, these songs are very hard to pin down live with one guitar only. • So you guys never considered getting a second guitar player in order to further support the rhythm? Is it purely because of economics that you have not done it so far? Tom: No, not really. I have talked to Bernemann to see if we could get a second guitar player for touring only but Sodom has always been a three piece band, you know, and that is what I like – just like the old Venom and Tank used to be. When it comes to play “In War And Pieces” live I play it differently than on the recording. On the recording the bass is very clean and not so aggressive. Waldemar actually said that if you give the bass a clean sound then you push the guitars more…it is different playing live and recording in the studio. We try to draw support from our drummer who plays very straight stuff and he really pushed both Bernemann and me, something which is really important. Live atmosphere is more important than any guitar overdubs! • It is interesting that you mentioned being pushed on this album as I also found your vocal contribution on this album to be more varied than usual. There are times that you use more of your shouting vocals and others where you use more your deep growling ones you seemed to have combined everything this time and the end result is really impressive! Tom: I actually had to sing each line in five different ways, something that I have never done before! When I was in the studio in the past I would do two takes and that was it. Waldemar loves the old Sodom vocals and also screaming style vocals like those of Tom Araya (note: Slayer) and of Cronos (note: Venom). After everything was recorded and he started mixing the album he would pick up what he wanted in order to achieve the best result possible. He used to say to me “I need more data in order to work” and I did that but it was very hard to work like that in the studio. • No regrets however after you listened to the end result, right? Tom: None. Waldemar is in pre-production three months before the actual recording session and he was really interested in the songs, the lyrics and everything. • Every song that you record must be like your ‘baby’ and I am sure that you love them all, but for me it is easier to make segregations. The song that I listen to the most from the new album, the one that is very impressive and which took me a little bit by surprise I have to say, is “God Bless You”. Do you mind telling me a few more in depth things about it? Tom: We don’t play this song live just yet. • No? That is slightly disappointing I have to say! Tom: It is the well-known problem – we have a new drummer that had to learn twenty two songs and we also had to play all the classics and also add some rarities. After the end of this tour we will start arranging the set list and we will add more of the rarities and of the new stuff there. “God Bless You” is also one of these songs that needs a lot of guitars but a song like this one can be compared to “Marines” or “”Buried in the Justice Ground” – songs like that, or even “Napalm In The Morning” as they share the same style. • That is the one song (note: “Napalm In The Morning”) that I had in mind when I was listening to it. Tom: With songs like that the importance lies in the chorus lines. “God Bless You” has a wonderful chorus! • When you started putting together the songs for the new album did you have any form of a ‘dynamics’ plan in your mind? I am asking because when I am listening to the album I feel that it kind of blends together in that respect and that I found to be a very good thing as it kept me focused throughout. Was that something intentional? Tom: Yes it was intentional as it is a very important thing to do. “In War And Pieces” is my favourite track of the album so we really had to start with that one…yes, you really need to achieve a good combination between the slow and the fast songs. “Through Toxic Veins” was not one of my favourite ones and so it had to be placed further down the line and that was a very simple and easy decision to make. Now, if we are going to play this stuff live and you listen to the album version you will find the latter to be more of a relaxing experience. • Tom, according to your website you are currently in the third day of this short tour and the remaining seven or eight days are mostly on German soil which makes sense seeing as you are a native band. Apart from these dates and your participation at Wacken this year, do you have any other plans? What about South America – a part of the world where you are absolutely adored? Tom: We are talking about playing in South America in the autumn this year and we are also talking about doing a US tour but I first have to find enough free time in order to do all that stuff. After this tour I will have to concentrate on the new Onkel Tom album (note: Tom’s more Punk orientated outfit) but yes, we will definitely do a few festivals this year. We are talking about Summer Breeze and my dream is to play at Graspop, a place that I have never played before! • That is interesting! Why is that? Tom: I don’t know why! • You have played everywhere around the globe and not Graspop which is in your neighbouring Holland? Tom: Maybe it’s because we are fu*king Germans – I don’t know (laughs). • Come on now – I don’t believe that for a minute! Tom: I don’t believe that either but…we are in contact with the promoter there and there are also some smaller festivals that we are going to play. Anyhow, I believe that the new Onkel Tom album will be a big surprise for many people. • Well, we are kind of used to that already (I laugh). Tom: We are also going to do an Onkel Tom tour at the end of this year! Tom: Yes, that is true – it is very German! In the beginning we were performing many cover songs, you know, drinking classics and other traditional songs but now we perform mostly our own songs. By the way, this here is the drummer of our band (note: Tom introduces me to Sascha Tilger) and he is here with us as he is helping Makka with his drums – we are like a family, you know? Now was the right time to do another Onkel Tom album as the last one was back in 2000 and was a Christmas album (note: “Ich Glaub’ Nicht An Den Weihnachtsmann”). Now we found a label, Drakkar Promotion, who did help Onkel Tom in the beginning and…yes – that album will be a big surprise for the whole scene! • Do you reckon that Onkel Tom is a project that can really grab people outside Germany? Can you see, for instance, Onkel Tom playing a show here in London? Tom: Oh, yeah, definitely! We played in Belgium the day before yesterday and we had so many Onkel Tom fans over there. We did an Onkel Tom signing session and people were screaming “Onkel Tom” to us. Maybe they cannot translate the lyrics but they know the message behind them, you know, which is ‘have a good party, have a good time, drink a lot of beer!’ Onkel Tom is the only band that allows other people to come up on stage during the show! I know that a lot of bands don’t like such a thing, you know, because they are afraid for their instruments and all the stuff that are there but we don’t because that is a Punk show! • Tom, for many people you are the real working class hero. We know your background, how ,as other members of your family before you, you worked in the coal mines and managed to get out of that hard life through devoting yourself to Sodom. Of all the things that you have achieved so far in your life, which are the proudest moments? • That was the year that “Agent Orange” was released. Tom: It was only when “Agent Orange” was released that I found that I could make a living from my music and that was a dream come true! Knowing that I didn’t have to wake up in the morning and go to work. I just started writing songs, going on tours and making new music…this was one of the best decisions that I have ever made! My father was like “no, you should not become involved with the music scene: go to work and try to get a better position in the coal mines and then go to school after that” – this is what he was saying to me but I didn’t want that! That was the best decision that I ever made and that I am really proud of it! • That was a scary thing to do also because you had no guarantees of success whatsoever. Tom: There are no guarantees at all. When you work in the coal mines you get paid every month and so you know what you have but being in the music scene for so long and making money out of it…that is very impressive! • Last November I went to Peru on holidays and I visited the town of Arequipa where I found three metal heads and when I asked them ‘which is the band that you most like to see’, the one guy who, by the way was wearing a Sodom T-shirt, mentioned you guys! Now that is something you would not have achieved had you stayed in the coal mine! • They are very spoiled, right? Tom: They are like ‘music police’ or whatever, you know? Instead, South American people are so crazy! They are hungry for music, you know? I don’t know a lot of bands that go to play there as you certainly cannot make a lot of money there! That is also the reason why we play in places like Bangkok and other strange countries. I know that we have fans world-wide and we want to take the chance and play everywhere! • When I saw footage from South America in your DVD it kind of reminded me how things were in Greece back in the day. Seeing Sodom live was one of the first gigs that I saw as a young boy back in 1987 with Flames (note: a Greek Thrash Metal band) in support and that was a gig that I will never forget! Tom: Greece is special! Last time we played in Thessaloniki it was really special! • They are still quite mental even though they have been quite spoiled these last few years. Tom: That was the most impressive gig that I have ever done! The people in Thessaloniki are absolutely crazy! There were plenty of stage divers which is something that we never mind as all we want to do is to play…crazy, crazy people! I don’t know why that is, though – it’s one of these things that I cannot explain. • I think that some people call it the Mediterranean temperament – that is how we justified it to ourselves the fact that we are mental! Tom: Yeah, so that is something that is always a great thing to experience as it helps push the band also when on stage. It is a hard job as you get to tour all the time but you get too much back from the fans, you know, and I always want to give something back to them too! I always try to stay after the show, doing signing sessions. I want to get close to our fan base. We are no Rock Stars – we are also fans of this music, you know? That is a big difference between Sodom and other bands, you know? • And that is why we, as fans, love and respect you guys so much! Tom: Ok, in places like Greece and South America you cannot physically talk to everybody, you know, but you can try! Do a little bit of talking, sign a few things, take a picture – I want to do all that, you know? I know other bands which go from the stage to the bus and then back to the hotel and never bother with their fans – I want to leave our fans satisfied! • Tom, what are you going to do when the time will come to put Sodom to rest? Do you have any specific thought in your head? Do you see yourself becoming more professionally involved in the recording side of things? Tom: No, no…I don’t know how to say that in English (laughs)…I don’t know when the time will come to stop doing music what it is that I am going to do! I will probably need to sell my house in order to get money – I don’t know! I never would be able to work in a coal mine again as they have closed everywhere. Maybe I could do something management related for younger bands which I support too, you know? Some bands ask me stuff like “I have a record contract, can you help me with this and that”? I am always happy to do that. • That is a great idea actually! Tom: Yes, but I am a musician and so what I want to do is to make music, you know? When I stop doing this…I don’t know. If I manage to stay healthy, I will continue doing what I do now and if I stop doing Sodom I will continue with Onkel Tom, which is an easier thing for me to do! Tom: I don’t have to hold a bass guitar, so I am free, you know? • Tom, thank you for doing this interview. I had a great time talking to you about “In War And Pieces” as it is a wonderful album indeed! Tom: It has been getting many good reviews, you know, and it has been awarded the title ‘album of the month’ by a few journalists and some online magazines are considering awarding it the title of ‘Thrash album of the year’! • Well, it is already featured in my list, just in case you are wondering! Tom: But there are also some great releases from bands like Exodus, Forbidden and Death Angel. I never mind – in the end what is important is for the fans to be satisfied, you know? We make our albums for our fans, not for the charts! We have reached position 64 in the media control charts after the first week but that was the pre-Christmas period when all the Pop bands came out with their own stuff…the truth is that, in the end, what is important is how much you sold and whether the fans are satisfied with your product. • Tom, let me make one last question: if you were to suggest a few good bands that you are currently listening to, which would these be? Tom: Well, there are many bands that are around me and which need support…there is a band called Eat My Body – you should check out their home page (laughs). The guitarist from Onkel Tom has also a band called Crossplane which sound like Motorhead and I like them very much! There you have Alex (note: Kraft) who played in Desperadoz and there is also a young band called Final Depravity which are friends of mine and who I try to support. I do, but they have to make things work by themselves, you know? They have to try and get better promotion. They have an album out now and they also have a record deal…but there are so many bands around…when we chose to have support bands for this tour we asked for them to be local bands from each place we visited. That was a good idea in my opinion! I was getting three hundred e-mails every day from bands who wanted to support Sodom in every place we visited! That was amazing as there are so many bands around and I listened to the work of each band that contacted me. It would have to be Thrash Metal as I did not want to have a true or a Death Metal band opening for us and I felt to give the chosen bands a chance. I never got a chance at the beginning of our career; it would have been a dream come true for me to open up for Motorhead but I was never given that chance. So yes, it is very important to support the local Metal scene! • Tom, once again, thank you very much for your time, I hope that you will enjoy tonight’s show and I wish you very good luck with everything you do!